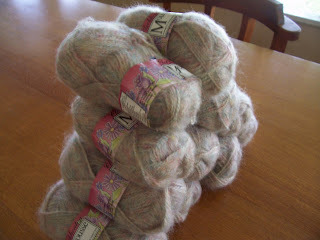 Grandma's Knitting Place: Yvette goes on a Yarn Diet - and falls off the wagon! Yvette goes on a Yarn Diet - and falls off the wagon! Made a New Year Resolution to go on a yarn diet. Got the idea from a Canadian knitter's group I am on - no purchasing of yarn between 1st January and 30th September - nine whole months! The deal is this - you get one "get out of jail free" card - you can only fall off the wagon once. Sock yarn doesn't count - but that only applies to Canada and United States IMHO - I don't need socks! You can buy yarn for a special project or gift - if you have to. And it doesn't count if you have to buy an extra ball of yarn because you run out. And gifts of yarn from friends and rellies don't count either! Well I lasted very well - but succumbed to some Cleckheaton Mousse on offer on ebay - well I got 11 balls of said Mousse for 15.00 including postage - work it out - it was about 1.38 per ball!! So that's me off the wagon for my one and only time! But from now on - it is strictly existing stash!! Anybody else going to join me?? No???? ?